Swinging steel signals start of brick and mortar expansion of Cobo footprint. Historic Cobo Arena conversion next on punch list. DETROIT—April 22, 2011—Construction crews have begun erecting the steel girders that will frame the 25,000 gross square foot addition to the rear of Wayne Hall, one of the four contiguous exhibit halls on the main floor of Cobo Center. The additional space is scheduled for completion by November of this year, and has in fact already been consigned for use by the North American International Auto Show in January of 2012. The addition is part of the Detroit Regional Convention Facility Authority’s (DRCFA) three-year, three-phased $270 million plan for the reinvention of Metro Detroit’s regional convention facility, and represents the transition between the second and the final phase, which is the start of the extensive restructuring and expansion portion of the transformation process. 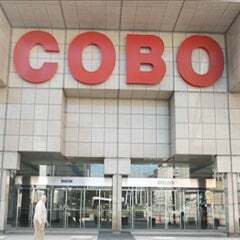 The entire bond-financed project is scheduled for completion by 2015 and will return Cobo Center to its historic role as one of North America’s premier meeting and convention venues. 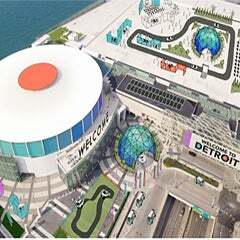 Phase One was a $3 million dollar initiative begun in September 2009 on urgently needed upgrades that was completed before the January 2010 North American International Auto Show. Phase Two was a $50 million dollar initiative that began in February of 2010 and entailed enhancements to the loading dock area and access/egress, electrical power and lighting improvements, 500 additional parking spaces and a partial re-roofing of the building, and the additional 25,000 square feet currently being added to Wayne Hall. 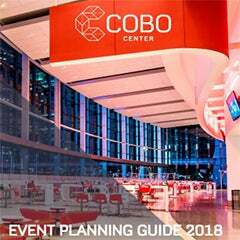 • The reinvention of Cobo Arena as a 40,000-square foot ballroom with supporting meeting, pre-function and back-of-house spaces. The arena is the former home of the Detroit Pistons, where former Piston Hall of Fame guard and current Mayor of Detroit Dave Bing played for nine years. Work on this new ballroom begins this summer and will feature a glass wall and open-air terrace facing Hart Plaza and Detroit’s downtown to the east, as well as pre-function space with a panoramic view of the Detroit River and the international border with Canada to the south. • Reconfiguration of most meeting and breakout room space throughout the venue, especially along the south side of the facility along the Detroit River, to meet the needs of today’s meeting and event planners. The majority of the exterior walls along the river will be replaced by high-efficiency glass walls to take advantage of Cobo’s riverside location and update Detroit’s signature river skyline view for the 21st Century. information, visit the Authority’s Web site at www.DRCFA.org.